Madre Bees is certified organic, containing only clean ingredients. The balm comes in four flavors: vanilla (which smells like vanilla pudding), mint, pomegranate, and unscented. You can snag them at iherb, which is an online retailer of everything organic (food, cleaning products, hair care, skin care, you name it). 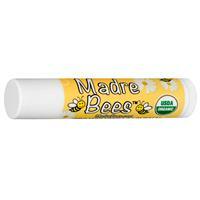 Madre Bees lip balm is new to iherb, so they're selling them for a promotional price. If you really like savings, then use my coupon code LGJ683. On your first order you'll get $10 off if you spend $40 or more, and if you spend less than $40, you will get $5 off. Need help padding your shopping cart? Check out Eden Foods, a line that sells canned goods with no BPA, and soymilk with no additives, amongst many other standout products. Or get your Acure fix with their full line. Want the organic laundry detergent I posted about the other week? They have that too. Organic extra virgin olive oil, organic beeswax, organic flavor, organic hemp seed oil, non GMO vitamin E.